Not so long ago our microwave died a not-so-quiet death. It zapped and fritzed and we quickly decided it was time to retire it. We’d had it a long time, and we used it a lot: for reheating many things; for morning porridge; for defrosting; for popcorn. 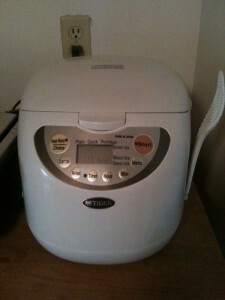 But getting rid of it freed up a large space, onto which I placed my new rice cooker. It has a timer, which can permanently remember two different times, settings for white, brown, mixed rice & porridge, reheat, and keep warm settings. It has a nice little slot for the paddle, and interior markings on the inset bowl so that you can pretty much tell where the water level should be (you can totally tell if you read Japanese). Now, I use the rice cooker all the time. I have one timer set to 5 pm, and I can dump in the white rice, mixed rice (part brown/part white, which is our favorite), brown rice, farro. (Caroline cooks quinoa, too) at noon or 1 or 2 pm and it’s done perfectly by dinner time. But here’s the added beauty: The second timer is set for 7 AM, and after dinner, I can dump in a cup of steel cut oats, 3 cups of water, and in the morning–hot porridge. No mess, no stirring for an hour. It’s genius. The kids love it. I love it. It’s made our lives–and especially our mornings–easier and some of our meals healthier. So, if you’re in the market for an appliance, or a new toy for your holiday list, get a rice cooker w/some of these features. You won’t be disappointed, even if it can’t cook popcorn. And: Thank you, Wakana, for your friendship. And the rice cooker! We think of you every time we use this! Timers, how exciting! When my almost-50-year-old rice cooker finally gives up the ghost, I’ll look for one with these features.